In 1966 London audiences were treated to a whirlwind of unforgettable performances from Leonard Bernstein and the London Symphony Orchestra. After their triumphant Mahler Eighth they went on to give several concerts that really do deserve to be called legendary. The Euroarts DVD of Shostakovich’s Fifth – originally filmed by the BBC – is a must for all Lenny fans, as it shows him at his galvanic best and in a symphony with which he was so closely associated (review). Not to be outdone ICA have issued this intriguing double bill – also a BBC production – recorded at my ‘local’, the Fairfield Halls in Croydon. The producer here is none other than Brian Large, who joined the fledgling BBC2 in 1965 before going on to direct some of the finest concert and opera videos in the catalogue. Another distinguished participant is the multi-talented Humphrey Burton, who chats to Bernstein on the Bonus track. Both concerts were subsequently aired as part of the BBC’s Symphonic Twilight series in January 1967. What a pity changing priorities have killed off such innovative programmes; yes we still have the Proms, but that doesn’t begin to compensate for the lack of filmed concerts, ballet and opera on the Beeb these days. 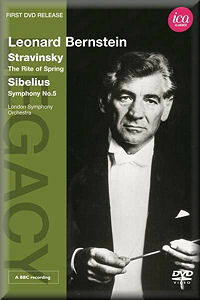 Stravinsky is reputed to have greeted Bernstein’s 1958 recording of Rite with a single word – ‘Wow!’ Seconds into this Fairfield performance – the opening of Part One has seldom sounded so jazzy – it’s clear we’re in for quite a ride. As expected rhythms are drum-tight and momentum never flags. And despite the ‘enhanced mono’ sound the timbral sophistication of the piece is remarkably well caught. Occasionally the brass has a slightly ‘covered’ quality but otherwise the music leaps out in a most thrilling fashion. Those earthy syncopations and elemental climaxes are very well handled, and there’s no hint of overload. Watching Bernstein – he’s in the picture most of the time – may be too distracting for some but his changing expressions and hip-swaying dances are surely an integral part of the show. In a score such as this it’s impossible not to be zapped by the electricity of the moment; Lenny’s good at that, but he’s also a master of tempo relationships, one section of the score segueing seamlessly with the next. The LSO – more like a bunch of bank managers and accountants than top-flight musicians – are unruffled throughout; appearances are deceptive though, for the febrile woodwind chatter and sneering trombones are as secure and alarmingly visceral as one could wish for. The monochrome picture is fine and the sound is more than acceptable; they certainly don’t detract from this superb performance, which is greeted with prolonged applause and an obligatory podium thump as levitating Lenny returns to earth. The chutzpah of this conductor never ceases to amaze me, and I can well imagine orchestras would play their hearts out for him. They certainly do so here, delivering a performance that makes Iván Fischer’s spectacular effort seem highly proficient but somewhat fitful by comparison (review). Oh, what I’d give to hear a conductor of Bernstein’s calibre in Stravinsky today. Programming Sibelius’s imposing Fifth Symphony after that could be construed as an act of folly; and in lesser hands it might well have been. From the first bars Lenny manages to induce goosebumps; he navigates this forbidding terrain as surely as a sherpa, all these outcrops and sudden massifs mapped and scaled with ease. Rarely have I sensed this movement is underpinned by a bubbling lake of magma waiting to escape; there’s just enough bass here to counter the over-prominent woodwinds and strings, and when the eruption finally comes it does so in huge, drenching style. Osmo Vänskä’s much-lauded Minnesota Fifth may be supremely well played but it’s no match for the sheer energy and heft on show here. If anything the Andante is even more of a revelation; I simply can’t recall it sounding this songful, its Mahlerian lilt so naturally caught. Happily that slightly artificial balance gives prominence to the lovely pizzicato writing and brings out the score’s seemingly endless supply of colour and detail. After the impassive monumentalism of the first movement Bernstein makes the most of the meadows before he embarks on a truly epic reading of the closing Allegro. Those great see-sawing tunes have never sounded so conflicted, or the brass so equivocal. Frankly I’ve never been so shattered by this music as I was here. Bernstein’s sweat-sheened features are evidence of the herculean task accomplished; the thunderous applause really is well deserved. Lenny was always a consummate communicator, and the ‘Bonus’ conversations with Humphrey Burton are chockful of insights and pithy comparisons. He cautions against clichéd views of Sibelius and reminds us that The Rite of Spring, rooted in the 19th century, is as much a twilight as it is a new dawn. He also spurns the notion of ugliness in this score, preferring to emphasise its grace. Short and to the point, urbane and mischievous, Bernstein is just as entertaining a raconteur as he is a baton waver. I regretted not nominated that Shostakovich DVD a Recording of the Month, but I can make amends by giving that accolade to this unforgettable coupling. Even as a fully paid up member of the LB Fan Club I will readily admit that his later performances and recordings are unforgivably self-indulgent; the slim, tanned and energetic Lenny of the 1960s was another animal altogether, and this unmissable DVD shows him at the height of his powers. Ditto the LSO, who prove yet again what a versatile and exciting orchestra they were then and, thankfully, still are today. Truly great performances; Bernstein at his magnetic best.